Ooey gooey butter cake has always been a family favorite. How could it not be? It is so easy and just so darn delicious. Some day I plan on baking one from scratch rather than starting with a mix, but this was not that day. Besides, I planned on pumping this one full of sprinkles to celebrate a coworker's birthday, so I thought it would be fun to start with a sprinkle filled cake mix. After all sprinkles are perfect for a party and more sprinkles are better! These cakes are so easy to make. Just press a cake mix based crust into your pan. Stir together cream cheese, eggs and sugar (I told you it was going to be good!) and spread over the crust. Add more sprinkles, then just few more for good measure. Bake. Try to wait for it to cool and devour! The hardest part will be convincing yourself not to make it weekly. Stir together cake mix, two eggs and melted butter. Press into a 9x13" cake pan. Mix together the cream cheese, powdered sugar, two remaining eggs and vanilla. Spread over cake mix crust. Spread sprinkles over cream cheese mixture and gently press in. Bake for 25-30 minutes, or until set. Let cool before serving. My little sister Chloe is the master of warming microwave desserts in the microwave. She warms them all up before eating it. I wasn't sure about warm ooey gooey cake, but it was pretty darn good. So feel free to warm a piece to try... or use this as a license to not let your cake cool completely before you dig in. I'm not judging! They are delicious, that is for sure! Thanks for stopping by! Ooooh! One of my favorites. VERY addicting for sure. Love that you made it pretty with the sprinkles. Mine too! It had been a while since I made them. I usually just use a dusting of powdered sugar, but thought sprinkles would be more fun! I keep reading of butter cake, but have never had them, and actually hadn't heard of them until recently. Either a regional thing, or I have just been missing out! What a happy cake with all the sprinkles, Carlee! I'm sure your family loves when you makes this. Thanks for your visit to my blog. I usually respond my email, but you're a noreply comment blogger, so I can't do that. However, I appreciate you stopping by. It is a fun one, that is for sure. Something about sprinkles just makes me smile! I have heard that I am a noreply blogger. I need to see if there is something I am doing to make it that way or if there is a setting I can change. Thanks, Kitty! Don't they?! Thank you so much, I hope the girls love it! 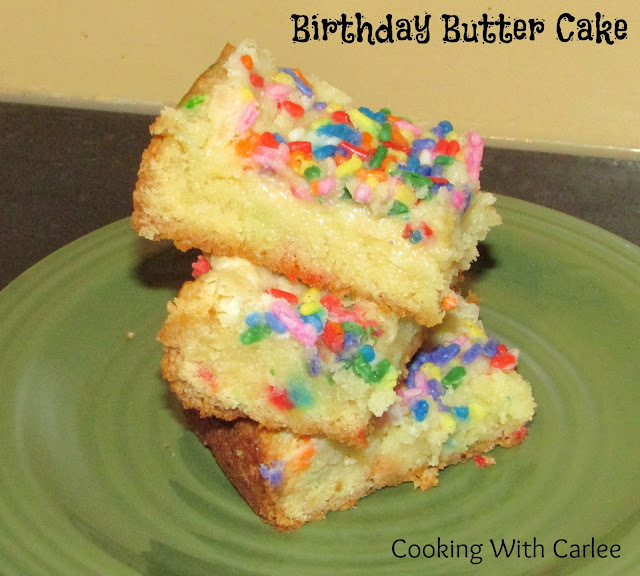 Butter cake - oh yum! Thanks for sharing on What's for Dinner! It's always been one of my favorites. 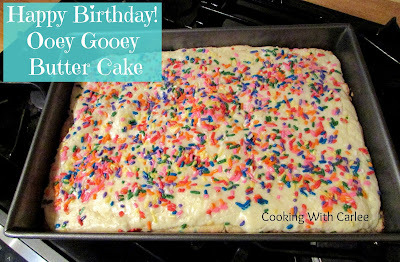 It certainly does look ooey-gooey, I can see why it is a family favourite! Thanks for sharing with the Blog Fair. secret that there is something incredibly sweet about you. Happy Birthday.